Extra Open Evenings in May. Come and look around. Open Evenings at the space in May. We’ll be running a couple of extra open evenings on Thursday 25th and Tuesday 30th May for people who want to come and look around the hackspace but are unable to attend our regular Wednesday night open evenings. Same time as usual, 8pm-11pm. 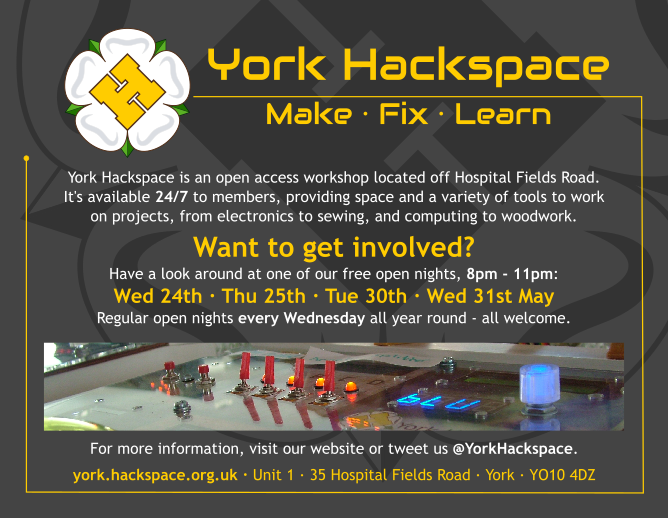 See https://york.hackspace.org.uk/wiki/Weekly_Open_Evening for more information including how to find us!